Chiang Khan is in North Isaan, right up against the meaty girth of the Mekhong river, looking across at Laos. The terrain is hilly and the views are even more dramatic when the skies are overcast and there is mist over the water. 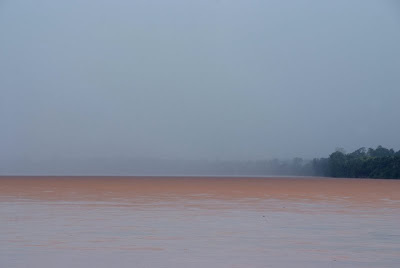 Since we were there in the peak of the rainy season, we had plenty of drama and the river was full to the brim. Fortunately, we also had some beautiful sunshine, which made for idyllic days exploring the beautiful countryside 60 km either side of town. I love the countryside, even more perhaps than beach settings - the green grass, farmland and flowers put me in a reverie and I feel euphoria with every seven league stride. We saw everything, from mountain forest to verdant pasture. We scrambled around on endless dirt tracks through gorgeous fields that at times looked a bit like England. We met and spoke to a group of sculptists working on beautiful stone Buddha images. We watched a village game of petanques. We found some really quite luxurious bungalows at 350 Baht a night, in a really quite beautiful setting in Pak Chom, 50km to the east of Chiang Khan. We met an interesting english guy called Ian, living in Chiang Khan. He has retired from the French Foreign legion. Now he lives alone and hates the world. We think he's just lonely. Nice guy, hard as nails, bit of a handful after a few beers and interestingly, a keen phtographer with a stash of classic exquipment. We were glad to meet him. Accomodation, food and scooter hire are cheap in Chiang Khan. 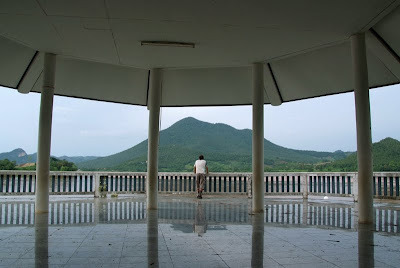 There are Buddha image stupas placed at altitiude in incredibly serene and picturesque settings. There’s a blissful lack of tourists. Things may change of course. 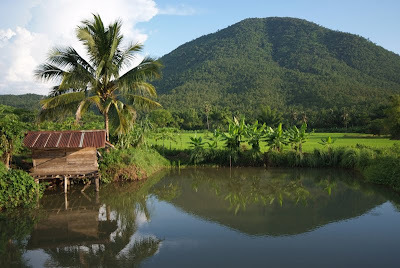 We had one splurge on a dinner in a Thai-French restaurant overlooking the awe-inspiring chocolate river from a hill on the western edge of the town. The owner kindly furnished us with smoke after dinner and told us of his plans for the site. The luxury bungalows are nearly finished, as is the 400 seater convention space, with snooker tables et al. In dry December and January the river sinks to expose a sand beach. He plans to hire out jetskis to residents, which quite frankly blew my mind. 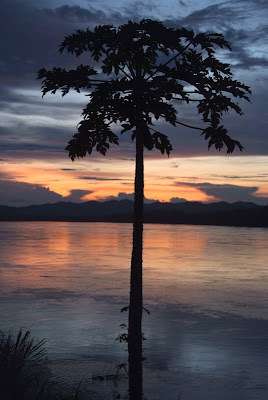 As the sun set in orange and red over the hills of Laos and we listened to the lonely cd of Beatles covers, we considered how large-scale tourism would affect the vibe of the place. However, the owner - whose demeanour (and laugh) closely resembled Danny Devito’s Penguin in one of the batman films – had already spent 17 million baht and 20 years on the development of the place, so we reckon there’s a little while yet before that happens. Wish I was there, v enervous of your adventures, can't wait to catch up when you get home, the writings great and the photography, BBBRRTTTTT. Big UP.